MACON, Ill — With the emergence of such quality race cars in the area and determined drivers prepared to put on a great show, the Big Ten Series will unveil the Pro Late Model Series in 2015. The crate late models with race a 10-event series with the champion earning $1,000 from the $3,000 point fund. Some of the top crates held their own last season while competing with super late models, and Macon Speedway plus other area tracks are proud to make the crate late models a regular attraction on the Illinois dirt this summer. Macon Speedway has long been known as a late model hotbed, and these cars will fly around the fifth-mile high-banked oval with some door-to-door racing that will thrill the crowd. The season opens May 8 at Lincoln (Ill.) Speedway before making its way to Macon Speedway on May 9 for the first of five series dates on the famed dirt track. 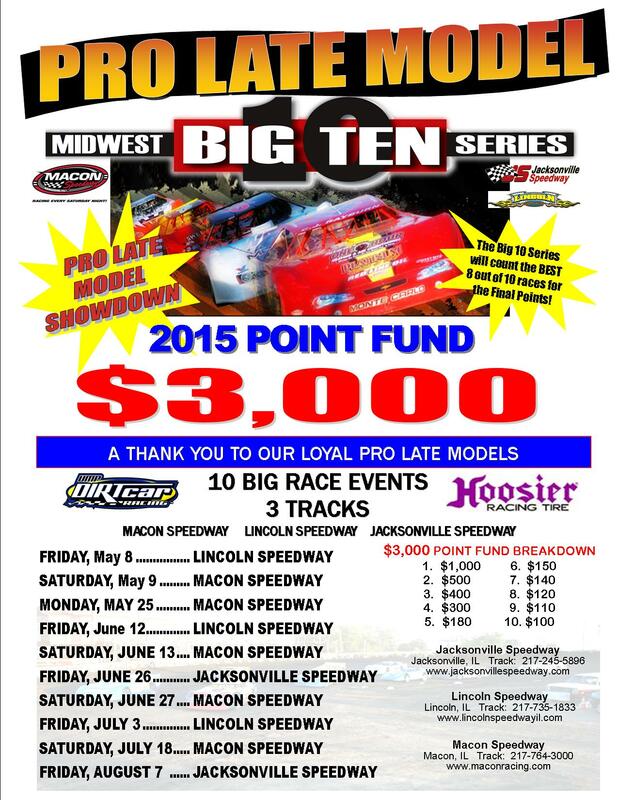 The inaugural Big Ten Series Pro Late Models will promise to add more excitement to the local racing scene. For more information, follow Macon Speedway online (www.maconracing.com), Facebook (www.facebook.com/maconracing) and Twitter (@maconracing). It’s easy to join the text service. Fans can text MSFANS to 74574 to receive all fan info. Drivers may text MSDRIVERS to 74574 to get driver updates. Message and data rates my apply. Updates are also available by calling Macon Speedway at 217-764-3000. Macon Speedway is located nine miles south of Decatur on U.S. 51, then 0.6 miles west on Andrews Street and south to 205 N. Wiles.